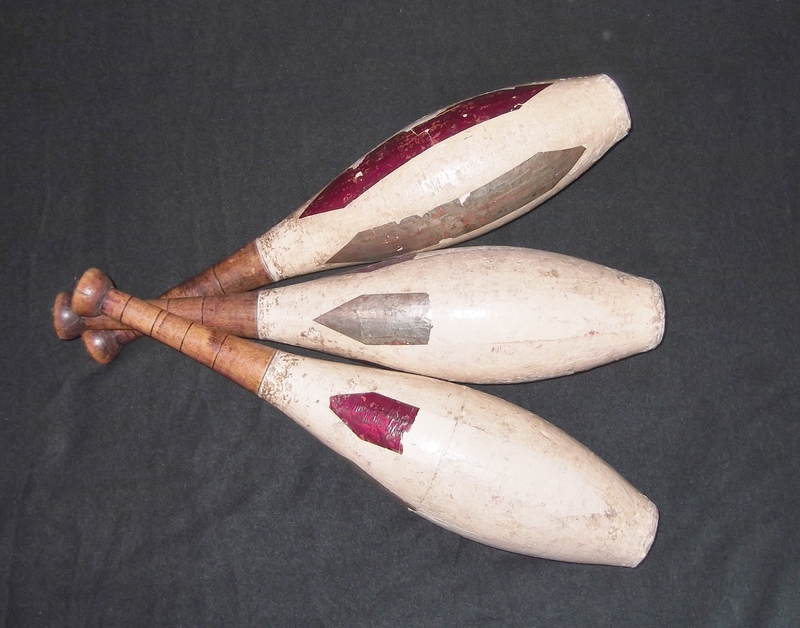 These are Van Wyck clubs formerly owned by Jay Meyer, a vaudeville era tramp juggler. Edward Van Wyck made clubs starting in 1895 out of his workshop in Cincinnati, OH, USA. Van Wyck clubs were the very first commercially available juggling clubs. 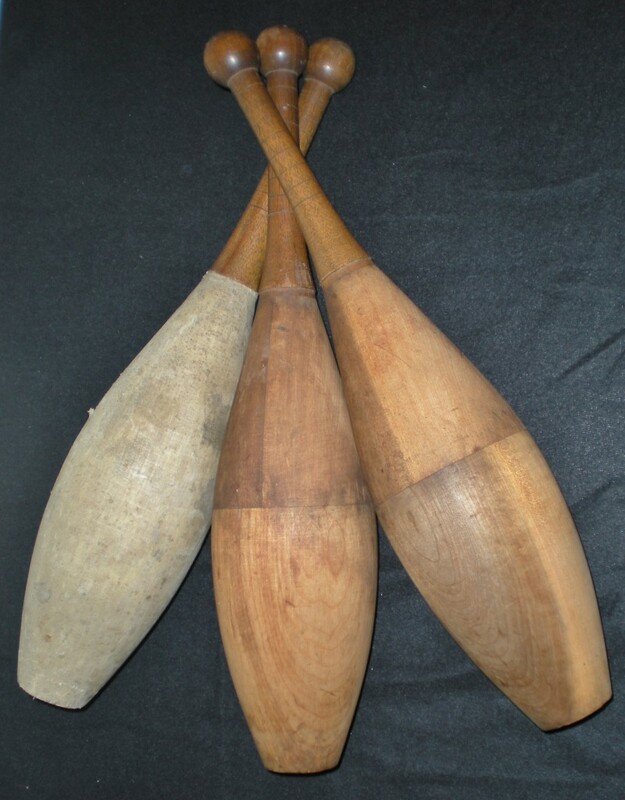 They are made of wood and feature a hollow body and three piece construction. These are an early set of Van Wycks with their decorations still intact. They were used by vaudeville juggler Lou Nelson. Purchased by David Cain. These are the only known set of short handled Van Wyck clubs still in existence. It appears that an owner cup off half the knobs to make the knobs flat ended. Purchased by David Cain. This is a very early (pre-1900) Van Wyck juggling club. Purchased by David Cain. This is a giant Van Wyck club. Acquired as part of the Paul Bachman collection. This is a mirrored Van Wyck club. Acquired as part of the Paul Bachman collection. This is a small Van Wyck club. Purchased by David Cain. This is a hollow wooden exhibition swinging club from the late 1800s. Although not made for toss juggling due to the thin walls, it was part of the inspiration for Van Wyck to create his clubs. This club was owned by Bobby May. Acquired as part of the Paul Bachman collection. This is a hollow wooden exhibition swinging club from the late 1800s. Although not made for toss juggling due to the thin walls, it was part of the inspiration for Van Wyck to create his clubs. Donated by Erik Aberg. This is a very early Harry Lind club dating from 1920. Harry Lind began making his wooden clubs in his Jamestown, NY (USA) workshop in 1919. 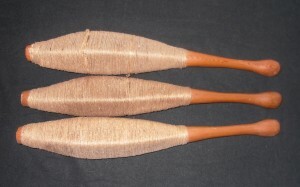 Lind clubs are hollow and made with three pieces, although their construction is different and superior to clubs made by Van Wyck. Purchased from Jay Green. These are unused Harry Lind clubs from the 1950′s. They have never been juggled and look as though they were just made. Purchased from Jerry Gildemeister. These are Harry Lind clubs from the 1950′s. Purchased from Jerry Gildemeister. These are Harry Lind clubs formerly owned by Tommy Curtin. Harry Lind made wooden clubs in his workshop in Jamestown, New York (USA) starting in 1919. Donated by Tommy Curtin. 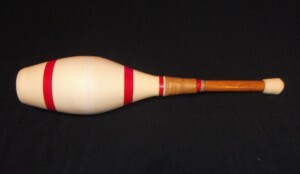 This is a wooden Harry Lind club from the 1950′s. Harry Lind made clubs from his workshop in Jamestown, NY (USA) from 1919 until his death in 1967. This is a Harry Lind octagonal club owned and used by Tommy Curtin. Donated by Paul Bachman. This is an unfinished Harry Lind club. It has already been hollowed out and the three pieces glued together. It is at this stage that the club would then be put on a lathe and finished before being wrapped with a glued linen. Donated by Paul Bachman. This is a Harry Lind club. Donated by the Jackson Family. This is a Doc Crosby club. Donated by Mick Lunzer. This is a Jackson Brothers club. Donated by Don Rapp. This is a Harry Parker skeleton club. Acquired as part of the Paul Bachman collection. This is a wicker club of unknown origin. Acquired as part of the Paul Bachman collection. 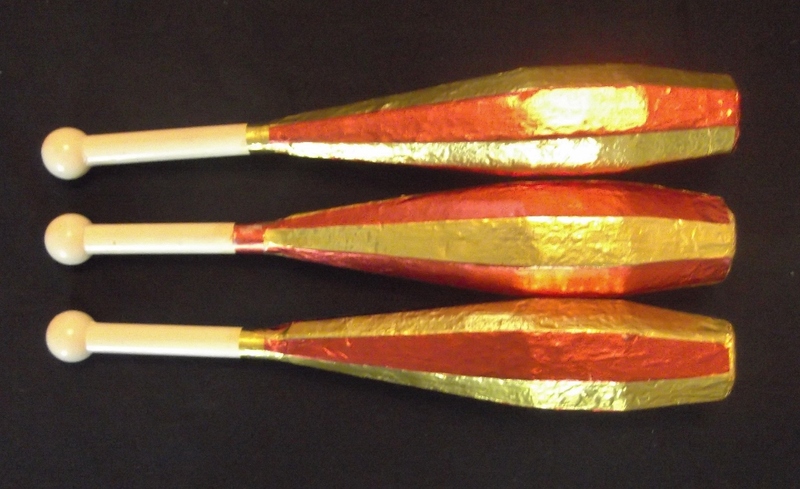 These are very rare Arthur Mann wood and paper mache clubs donated by and formerly owned by Tommy Curtin. Arthur Mann began making props out of his workshop in Chicago, Illinois (USA) in 1946. 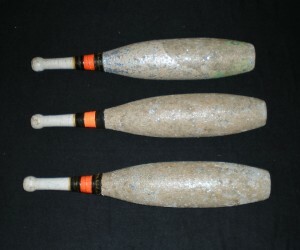 These are three Arthur Mann clubs constructed with a wood handle, metal end cap, cork knob, and a body consisting of painted fabric stuffed with horse hair. It’s believed that these are from the 1940′s and were previously owned by Roger Montandon. Purchased from Tim Toole. This is a George Toel hollow wooden club from the late 1940s or early 1950s. George Toel was a prop maker from Pekin, IL (USA) and made clubs patterned after Harry Lind’s clubs. Purchased by David Cain. 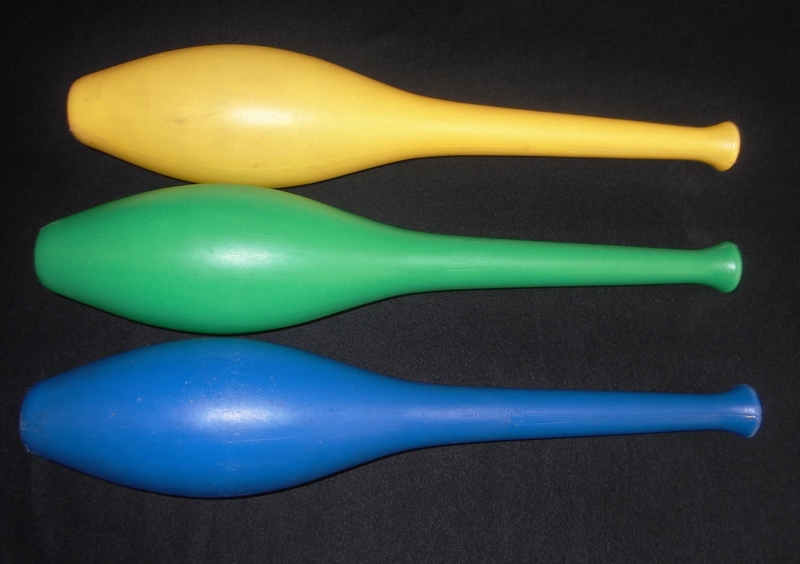 These are kid-sized hollow plastic juggling clubs made by the Irwin Corporation of New York City in the 1950s. 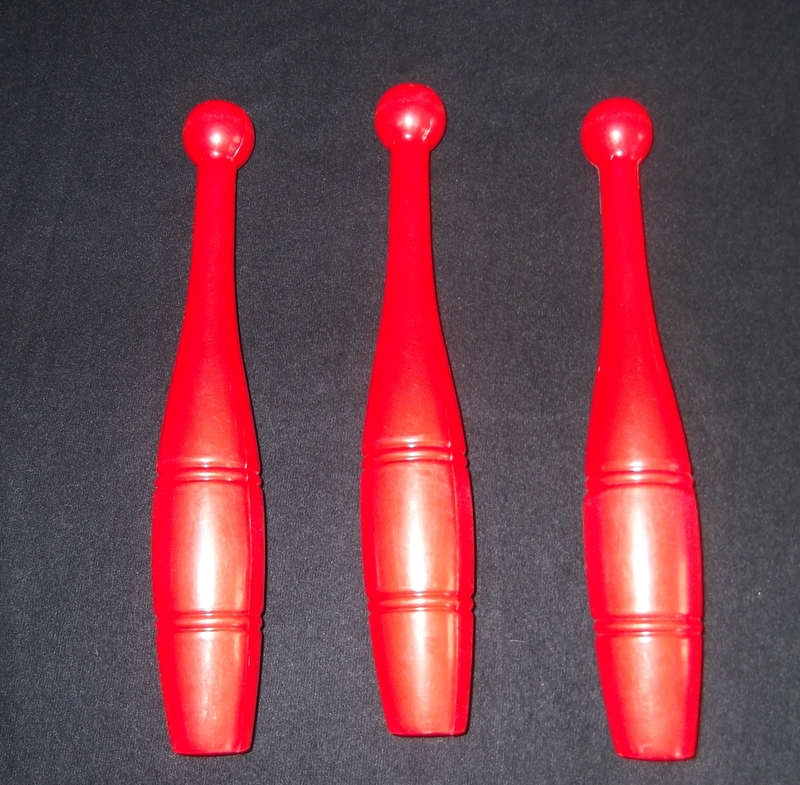 They are the first plastic juggling clubs ever produced. Purchased by David Cain. 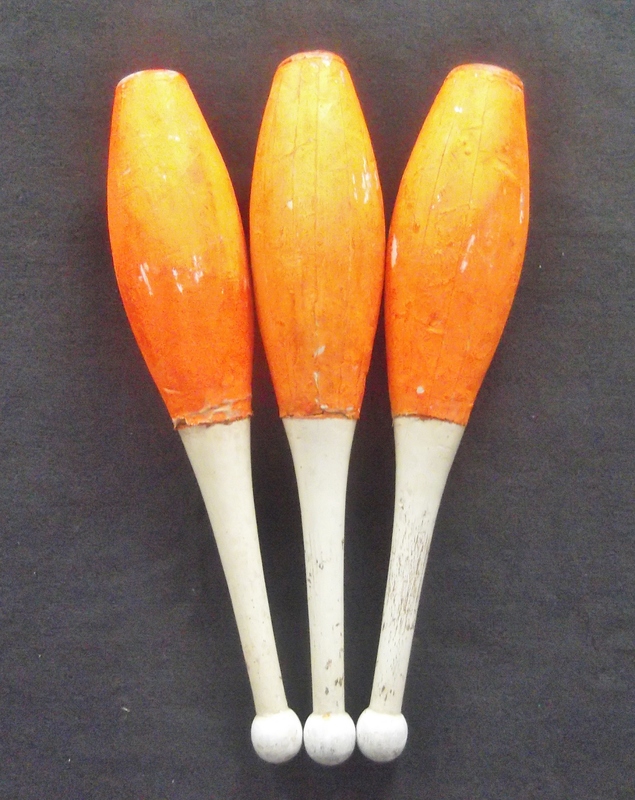 These are wooden juggling clubs from the 1950′s. They have painted and taped handles and a sparkled painted body. Purchased by David Cain. 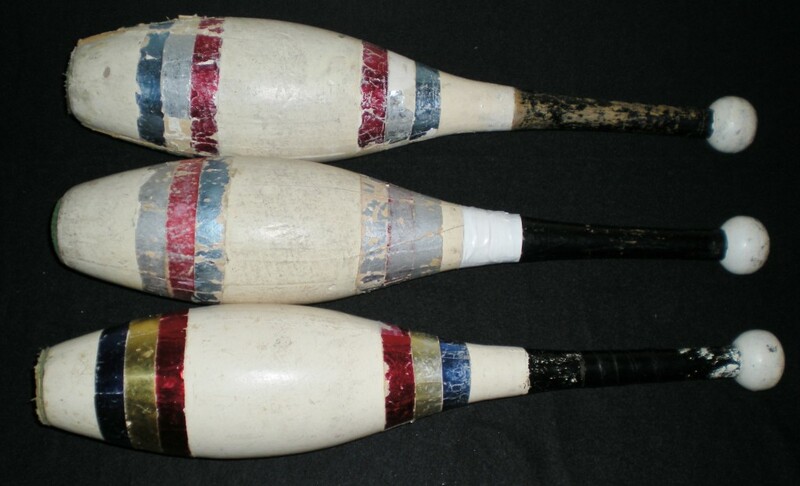 These are twine wrapped, five sided skeleton clubs from the 1950s. 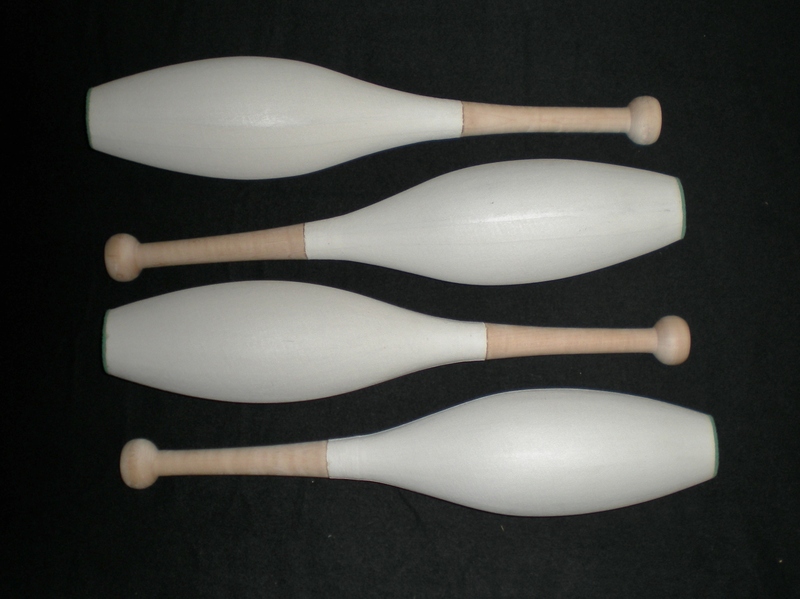 They have all wooden construction consisting of a handle, thinner internal dowel, internal disk, end cap and bamboo struts. Purchased by David Cain. 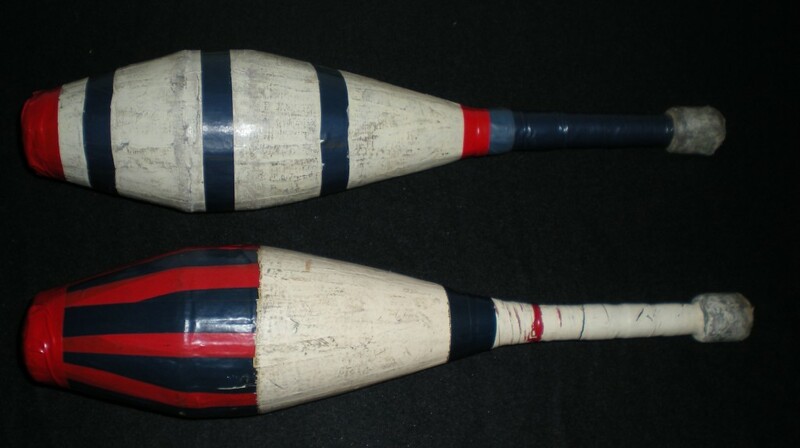 These are hollow wooden clubs from the UK, used in the 1950s and 1960s. Purchased by David Cain. This an old cork-bodied club donated by Paul Anderson. 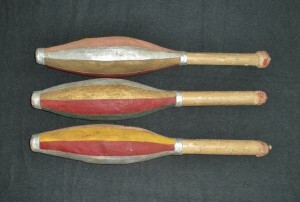 These are old cork-bodied clubs donated by Paul Anderson. 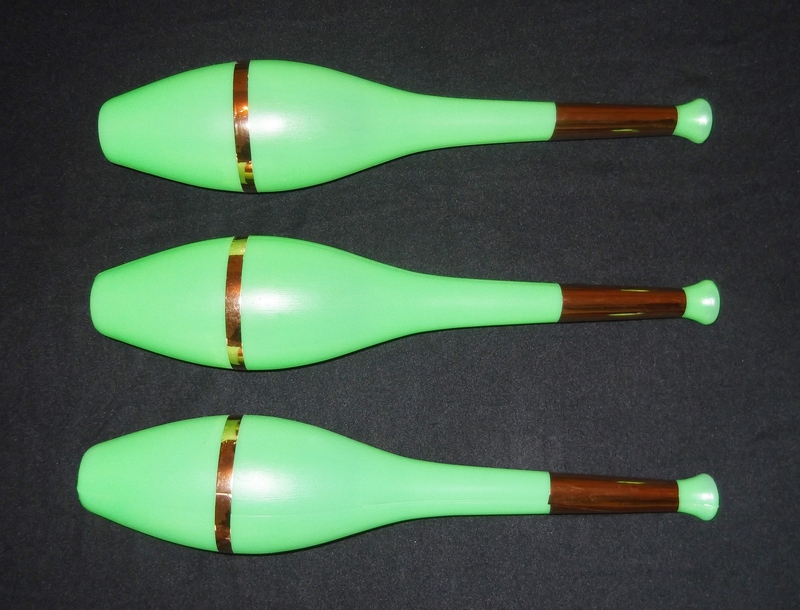 This is a hand made lighted wooden juggling club from the 1960′s. 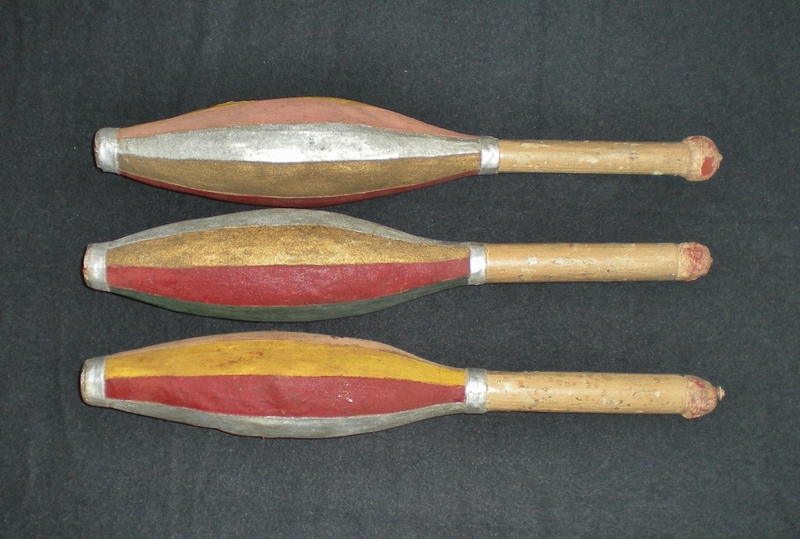 It is one of nineteen such clubs that was used in a British circus act in the mid to late 60′s. It is powered by two AA batteries and has a small light bulb under the plastic cap. 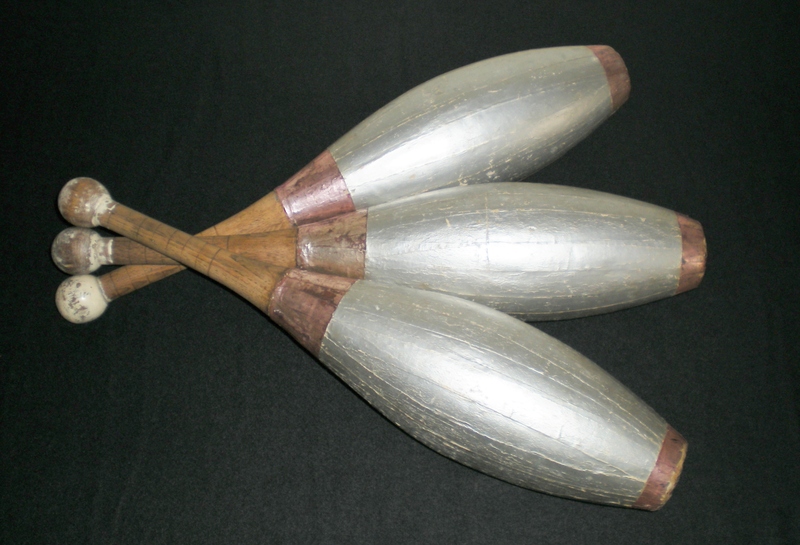 This is a wooden and plastic juggling club made and sold by Homer Stack during the 1960s. Donated by Paul Bachman. This is a Jack Miller club from the 1960s, owned and used by Paul Bachman. Donated by Paul Bachman. This is a hollow wooden juggling clubs from an unknown maker. It is believed that they’re from the 1950s. Donated by Jim Calkins. This is a solid wood club from the 1950s or 1960s. It was used by a circus clown. Purchased by David Cain. 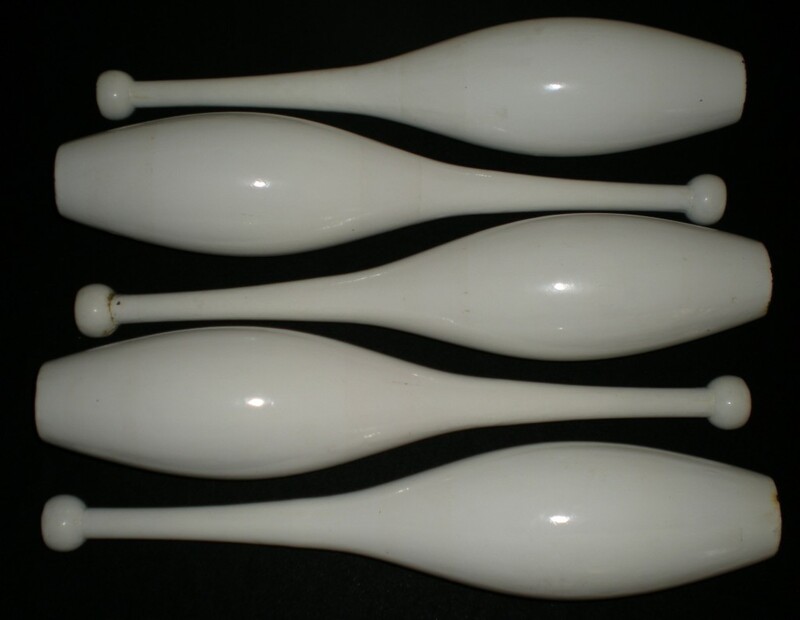 These are hollow plastic juggling clubs purchased in Copenhagen in 1961. They were said to have been made in Italy and were marked with a “Havemann” sticker. These were the first “full-sized” hollow plastic clubs, although they are still small compared to modern clubs. These are clubs made from the same mold as the “Havemann” clubs above, but with thinner walls. They were sold in a German magic store in the early 1960s. Donated by Charlie Holland. This is a Dave Madeen club from the early 1960s. Purchased from Jay Green. This is a Jay Green club from 1966. These were the first plastic, multi-peice juggling clubs. 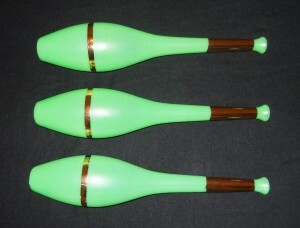 These were the first clubs to feature a flex handle and foam knobs and end caps. Jay Green. 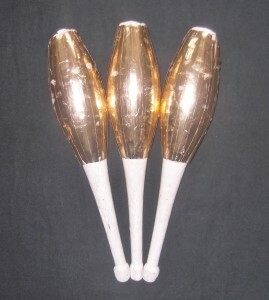 a former International Jugglers Association Champion, began making his clubs in 1964 in New York City, NY (USA) using off the shelf materials. Purchased from Jay Green. 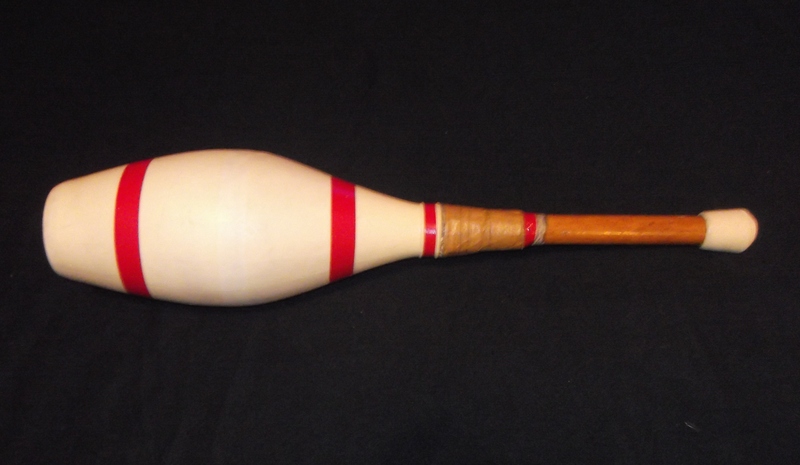 This is a very rare hollow Ken Benge fiberglass American club from the late 1960s. Donated by Jason Kollum. These are Stu Raynolds fiberglass clubs donated by Jim Ellison. 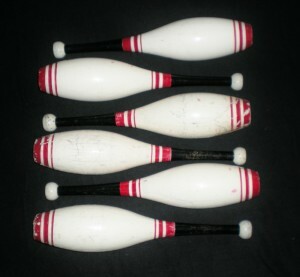 They are the Harry Lind Jr. model with a flat ended knob. Stu began making his hollow fiberglass clubs in 1969 from his workshop in Wilmington, Delaware, USA. These are long handled Stu Raynolds fiberglass clubs donated by Darrell Toomey. Stu began making his hollow fiberglass clubs in 1969 from his workshop in Wilmington, Delaware, USA. This is a club used by the Stevanovich Brothers from Brazil. Donated by Caio Cesar Stevanovich. This is a club used by Fabiano Stevanovich from Brazil. Donated by Caio Cesar Stevanovich. This is a club used by the Fonesca Troupe from Brazil. Donated by Caio Cesar Stevanovich.